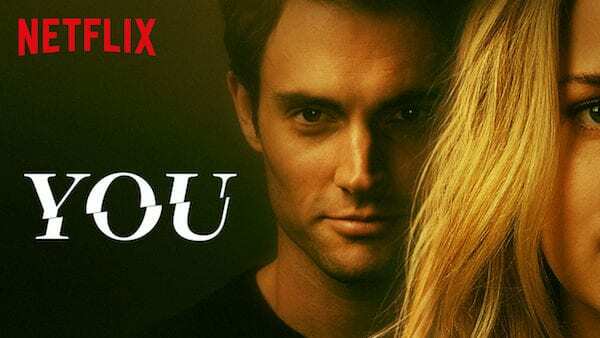 If you're looking for your next series to binge, check out "You" on Netflix. You'll feel so creeped out that you won't know whether to keep watching or turn it off. Netflix has been killing the game recently, impressing their viewers with their original horror and thriller series. From shows like The Haunting of Hill House (now my favorite series) to The Sinner, they've been wowing fans from all over. Since they've finally been impressing me with their original series, I've been obsessed with seeing what else they can come up with. You premiered on Netflix back in December, but I didn't notice it on the homepage until last week when Joe's head (Penn Badgley) popped up on my screen. I watched the trailer and felt instantly creeped out (that's when you know it's good, right? ), not knowing whether to click play or scroll along. After I found that I couldn't stop thinking about the trailer, I finally decided to give the show a chance. In short, I was highly impressed. I binged the entire series in two days (don't judge me) and feel no remorse -- except for maybe the nightmares that I've had. You is like that creepy uncle who ends up hitting on every girl (even family) at the BBQ, making you feel obligated to high-tail it out of there as soon as possible. I feel victimized, and I wasn't even in the series -- the eery thought that this could have happened to me while I was single is what made me keep watching. Although he made me extremely uncomfortable and I knew how dangerous he was, I found myself attracted to Joe, which is daunting because the sheer thought of being stalked by him is freaky. He pulled off "the nice guy" with Gwenivere so well that I had a hard time depicting between when he was being creepy and when it was meaningful. Just look at how he looks at her. The acting, the fact that it kept me watching because I needed to know what happened next, and the realistic appeal. I could not help but hate on Peaches even though she was right about Joe. I also hated the fact that Joe was sort of right about her, in some cases -- for instance, pointing out that she had no curtains on her windows and everyone could see what she was doing. Besides being incredibly suspenseful, I liked that the show felt very realistic, which made it scarier. You takes a jab at "public" social media accounts by pointing out the dangers. When Joe pasted Gwenivere's photo into Google, he actually found her address (insane, right?) and I looked over to my boyfriend, and he knew exactly what I was thinking -- oh, heck no!! I have not watched a series that has creeped me out this much except The Haunting of Hill House, because of the possibility that it could happen to me. Side note: All of my social media accounts are now set to private. You is a cautionary tale for single women in the dating world, successfully representing how careful you have to be in this day in age. I recommend that everyone give You a chance -- and especially if you like shows that will chill you to your bone. Netflix is raising their prices -- to pay for all these new shows! Read all about it here!